At Patchogue and Hampton Family Dental, Dr. Richard Richter and his team are dedicated to providing clients of all ages with beautiful, straighter smiles. As a tenured instructor and international speaker for Progressive Orthodontic Seminars, Dr. Richter is a reliable authority in the field. Our dentist performs comprehensive procedures to create proper alignment, whether it’s for developing smiles or adults who need corrective work following previous treatment. We offer multi-phase treatment for adolescents with a mix of adult and baby teeth or bites that require proper alignment. Our approach is designed with each unique case in mind. Our dentist serving Patchogue and Hampton works to prevent and treat structural issues that impact both the appearance and function of a patient’s bite and smile. During the first phase, we introduce interceptive techniques that can ensure the proper development of a child’s oral structure. Dr. Richter diagnoses and treats crooked bites, utilizing bite guards that can be worn during the night. This allows space for adult teeth to erupt and prevents potential crowding. The goal at this stage is to prepare for any corrective appliances that may be needed, such as braces and retainers, which are provided in subsequent phases. We are aided in our assessments by 3D imaging, which provides us with precise images to plan properly for future treatment. When treating adolescents, Dr. Richter tackles issues head-on as the patient’s bite is largely established and may benefit from alignment correction. We offer transitional treatments, mainly braces, and Invisalign® Teen, that can help adjust the patient’s bite and prevent future discomfort. We also offer braces with individualized brackets and Invisalign® clear braces for our adult patients. Because a straight smile is a healthy smile, correcting issues with the bite often contributes to improvement or prevention of conditions such as TMD (temporomandibular joint dysfunction) and periodontal (gum) disease. Patchogue and Hampton Family Dental is a preferred provider of Invisalign® products. 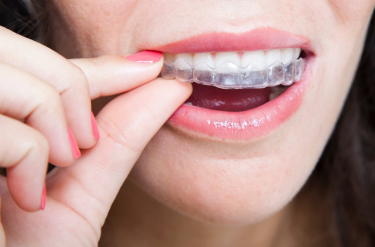 Invisalign® clear aligners offer a more aesthetically pleasing alternative to traditional braces, as they are clear and blend in with your smile. These clear aligners need to be worn throughout the day but are removable, allowing you to enjoy mealtime as usual and easily maintain routine cleaning habits. We offer a full assortment of Invisalign products, including the traditional variety, Invisalign Teen, and Invisalign Express. In some cases, we provide a combination of services, where conventional brackets are provided along with clear braces in order to achieve optimal results. Dr. Richter and his team don't limit their orthodontic care to one approach; our top priority is to ensure your satisfaction and health. Dr. Richter and his team at Patchogue and Hampton Family Dental offer various orthodontic solutions for patients at all stages of development in the greater Patchogue area. If you have any questions or want to schedule an appointment, call our office today!